Also for the first time ever the PRINT official room block has the new Hiltons at McCormick Place. This is the first tri-branded property for the Hilton brand and it consists of a Home2 Suites, Hilton Garden Inn and Hampton Inn. These are connected to the convention center via indoor skywalks. Valet parking is available for $59. Check-in is at 3 p.m. and check-out is at 12 p.m.
Hotel rewards members can also earn points when booking in the official room block, just as they would by booking directly with the hotel. Simply include your account number in your reservation. The deadline to book in the official hotel block is August 30th. Call a Booking Specialist toll free at (800) 305-0039. Tweet about the event using #PRINT19! Don’t forget to Follow us @Expovision_inc. The Brand: Home2 Suites are designed with the budget-conscious traveler in mind. You’re “Free to be you” with complimentary continental breakfast and free Wi-Fi access. This is ideal for a short business trip or an extended stay thanks to an array of facilities including a fitness center, pool, coin laundry and laundry/valet service. The Brand: Hilton Garden Inn has been a Hilton brand for over 15 years and has grown to over 530 locations worldwide. This McCormick Place location has an on-site convenience store, room service and laundry/valet service. Breakfast, lunch and dinner are served at the Garden Grille & Bar restaurant. The Brand: Hampton has an even larger global presence with over 2,000 locations. Similar to the Home2 Suites, Hampton Inn provides convenient amenities like free breakfast and complimentary Wi-Fi in guest rooms. Services and facilities include a pool, business center, snack shop, fitness center, laundry/valet service and room service. Enjoy free coffee and tea in the lobby 24-hours a day! 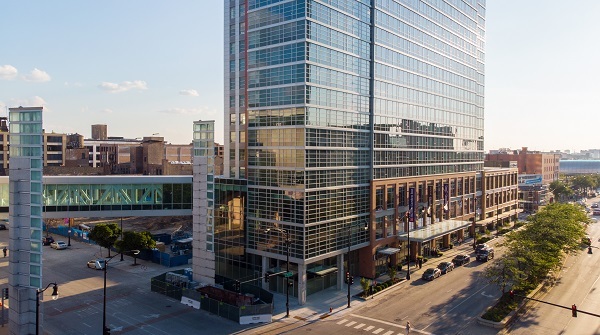 The first hotel adjacent to the largest convention center in the world (Yes, McCormick Place!) Hyatt Regency McCormick Place opened in 1998. It has over 1,200 guest rooms and suites. All rooms have Jet Pack technology hubs and spacious workstations. Services include dry cleaning/laundry, FedEx Business Center, concierge and valet parking. This four-diamond AAA rated property opened in the fall of 2017 and is the 7th Marriott Marquis property in the world. It has 40 floors and over 1,200 rooms! Its design is modern and minimalistic with neutral colors in the guest rooms. The lobby has 30-foot tall ceilings and artwork commissioned from local talent. Services include 24-hour room services, concierge, valet and dry cleaning. Expovision is the PRINT Hotel Reservation Office. If you’ve been contacted by a hotel scammer, please report them to printhotels@expovision.com. Please note: Rates are as of 1/23/2019 and are subject to change until booked.